I don’t usually review movies, and this isn’t so much a review as a cautionary tale about how the most brilliant idea can be destroyed by a lack of good worldbuilding and attention to detail. I’m talking, of course, about the movie In Time. In a future where people stop aging at 25, but are engineered to live only one more year, buying time is buying a chance to live another day. When Will Salas is given a century of unexpected life, he has a chance at immortal youth … if he can keep from being murdered for his time. But the system never planned on Will discovering where all that time came from … or where it shouldn’t go. Taking the above example of immortal youth, if the world truly is filled with beautiful 25 year olds and it’s impossible to distinguish relationships by visual cues, then either 1) the society would have made those relationships irrelevant or 2) the society would have evolved some kind of marker to distinguish people. Maybe this is only a problem for the rich/long-lived, so people from the time-ghetto wouldn’t have the problem of having adult mothers around to be confused with adult daughters. But amongst the time-rich, social markers would surely have evolved. They could be extreme or subtle, but they would be there, especially if living a long life is a sign of time-wealth. Maybe the women would wear extra earrings, or maybe both sexes would have a tiny tattoo hash to “mark time” they’ve been on the planet. This could be revealed in cool ways – a faux embarrassment covering the marks or a tantalizing reveal of them. Our confused protagonist could ask about them, or the protective antagonist could admonish his daughter for flaunting her two hash marks. It could be anything, but ruining that awesome worldbuilding tidbit with some telling dialogue missed the chance make the world deeper and more cool. And keep the viewer/reader firmly entrenched in the story. In Time didn’t trust its viewers to understand all the nuances of this brilliant future dystopian world, and I can understand the temptation to explain, to make sure that the audience “gets” the point. But having a brilliant concept requires some brilliant execution, to deliver on the promise of that premise. In Time didn’t live up to that promise, but I still recommend that you see it. Look for the missed chances to show rather than tell how the world works, for trite explanations or anachronistic “time” jokes. I’m giving away a $10 Barnes&Noble Giftcard, but the giveaway ends Tuesday December 20th! 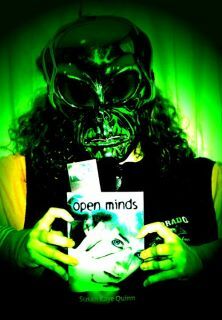 To enter, just post a picture of the cover of Open Minds on my Facebook Page (or email it to me and I’ll post it for you). Ebook or paperback doesn’t matter. Creativity is always nice! That sounds like a great movie! And so true – a brilliant concept needs brilliant execution! "In Time didn't trust its viewers to understand all the nuances of this brilliant future dystopian world, and I can understand the temptation to explain, to make sure that the audience "gets" the point." -I love this! Sometimes I live this :-/ Yet I get so mad when a writer treats me like a 1st grader and takes me by the hand and points out all the clever innuendos. Might have to tape this little piece of wisdom to my computer. I really enjoyed this review. I haven't seen the movie, but the husband wants to when it comes out in DVD. I agree with all your points about backstory, it's a thin line between too little or not enough. But I hate it when writers don't trust the reader enough to figure it out without telling us everything. I remember briefly touching on this movie when I was doing my Movie Thursday series before NaNoWriMo. I agree with you. The concept sounds like sci-fi awesome. I haven't seen it yet, but reviewing your post makes me wonder, are most of the kids in the Time Ghetto orphans since the bodies are engineered to only last one more year? Just something that crossed my mind while I was reading your post. Sad – I remember thinking the concept sounded awesome. I've actually seen this a lot recently in films. I had a similar problem with Avatar, which I was enjoying until the end when it felt like I was being bludgeoned by the moral of the story instead of allowed to come to the realization on my own. It really pulled me out of the story and made it harder to enjoy. hi miss susan! i didnt see this movie and it not on my list. cool review. i just learned that anachronist word the other day from off miss dianne salernis blog. now i know it just way important to get stuff right in time. Great job on the review. I saw the movie myself and really enjoyed it.